GoAccess: A Visual, Real-Time Web Log Analyzer — An open source log analyzer and interactive viewer that runs in the terminal or through the browser. Supports logs from Apache, Nginx, Amazon S3, Elastic Load Balancing, CloudFront, etc. A One Size Fits All Database Doesn't Fit Anyone — Amazon’s CTO is often asked why AWS offers so many different database products. Here, he explains why, and explains his conviction that using multiple databases within an app is a good move. 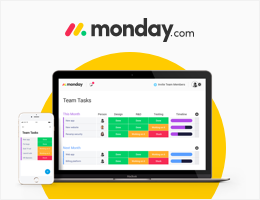 The Revolutionary Project Management Tool Is Here and It’s Visual — monday.com is a visual tool your team will actually enjoy using. It makes it fun and easy for everyone to collaborate, focus on what's important, and get more done. A project management tool that’ll help you and your team collaborate and achieve more. How BuzzFeed Migrated from a Perl Monolith to Go & Python — BuzzFeed have recently migrated from a monolithic Perl application to a set of around 500 microservices written in a mixture of Python and Go. Bare Metal Kubernetes Clustering at Chick-fil-A Scale — The American chicken restaurant will be running Kubernetes at the edge in its 2000 restaurants. Sadly the answer to “why are you doing this?” is to follow in a future post. Spiral: How Facebook's Services Use Machine Learning to Self-Tune — Spiral is a system for self-tuning high-performance infrastructure services at Facebook scale, using real-time machine learning techniques. AWS Lambda Adds SQS to Supported Event Sources — AWS’s serverless platform Lambda now supports SQS (Simple Queue Service) triggers to invoke serverless functions, and you can use this to turn the Simple Queue Service into a true message broker. Or prefer full docs and a tutorial? Optimize Website Speed with Chrome's DevTools — How to use Chrome DevTools to find ways to make your sites load faster. What's The History Behind 192.168.1.1? Why Not Another Address? Kubernetes 1.11 Released — Go behind the scenes with this podcast interview with Josh Berkus and Tim Pepper. lightproxy: An Easy Way to Use Local Domains for Development — lightproxy lets you map hostnames to a local port. You can also point a hostname to a folder and serves file directly out of the folder. JVM Profiler: A Tool for Tracing Distributed JVM Apps at Scale — Uber has open sourced its distributed JVM profiler.